Dr Atul Bhaskar completed MBBS and Orthopaedic Residency from the Seth G.S. Medical College & K.E.M Hospital, Mumbai and then travelled to the UK on the Overseas Doctors Training Scheme (ODTS) and pursued higher surgical training in the UK. He joined the Specialist Registrar (SPR) training program in Orthopaedics in the Yorkshire Deanery (United Leeds Teaching Hospitals) and passed the FRCS degree in General Surgery in 1999 and subsequently the FRCS (Trauma & Orth) degree from the Intercollegiate Board, Edinburgh, UK in 2000. He pursued his Paediatric Orthopaedic Training at the world renowned Hospital for Sick Children (HSC - Toronto) under Dr R B Salter, Dr W Cole, Dr B Alman and Dr Jim Wright. HSC has trained more than 300 Salter fellows in North America and around the world. He is one of the first Salter fellows to return to India. Dr Bhaskar has done pioneering work in conservative treatment clubfoot and its relapse following the Ponseti technique. He is one of the few authors to have published the results of clubfeet treatment in India. He has one of the largest series of clubfoot in the country and has also analyzed the relapse pattern in clubfeet following the Ponseti technique. He has participated as faculty in Ponseti training programs in India and abroad. He has written a book on “Paediatric Fracture Management” and has several innovative papers to his credit on paediatric trauma. He has published on single bone fixation in forearm fractures, titanium elastic nails in children and has done original work in “Missed Monteigga Fracture” challenging the premise of annular ligament reconstruction. His special interest also involves minimal access surgery in paediatrics and he has popularized the techniques in management of Congenital Vertical Talus and Sprengel deformity correction. He introduced growth modulation surgery in India using the indigenous “8” plate which has grown popular in the last 5 years. Dr Bhaskar has several publications to his credit both in national and international journals. 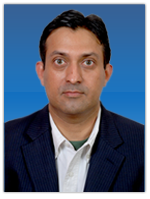 He is also invited editor for paediatric orthopaedis in the Indian Journal of Orthopaedics. He has presented papers at several national and international meetings and has participated as faculty both in the SAARC region as well as overseas. He is currently attached to some of the most prestigious hospital in the city of Mumbai and has a dedicated Children Orthopaedic Clinic at Andheri.